Travesa is a family company dedicating itself to the transport of liquid products and intermodal transport since more than 40 years ago. Travesa is a familiar company dedicating itself to the transport of liquid products and intermodal transport since more than 40 years ago. We began our business doing transport for Citroën and Seat. Under our old name, Transporte Huertas, we began to carry out cistern transport to cover our client needs, as well as beginning to apply entrepreneurial techniques in the transport sector. We have achieved a deep understanding about national and international market over time. We created our logistic group dedicating itself to the transport of liquid products in cisterns since the eighties. 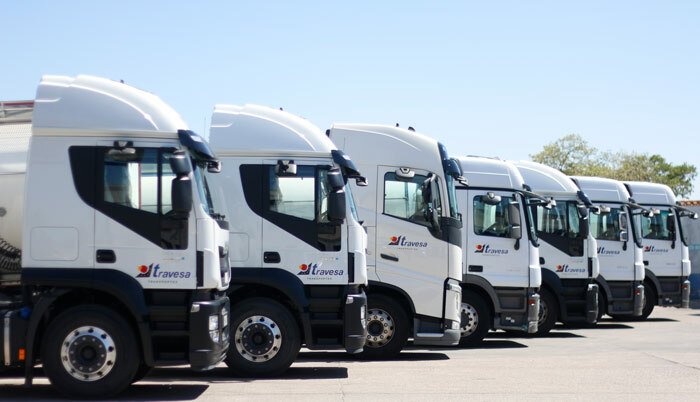 Nowadays, we can say that Travesa along its subsidiaries Gestión Europea de Cargas S.A. (GEUROCAR) and Lavaderos de Castilla-La Mancha S.A. (LAVACAM) has with one of the most important and modern fleet in the market, thanks to the continuous modernization and updating of our fleet, reaching a whole traceability of our transport service. We have a goal, continuous progress and our flag is the service transport quality by road and intermodal transport. Behind this, we have an extraordinary human team that works with security and respect for the environment. © 2017 - 2018 TRAVESA. All Rights Reserved.